Who is Vembu Backup & DR? Vembu Technologies is a software company which isn’t well known, because they focused at the service provider level first, since 2004. As a result, Vembu has 60000 clients through 4000 service provider network. 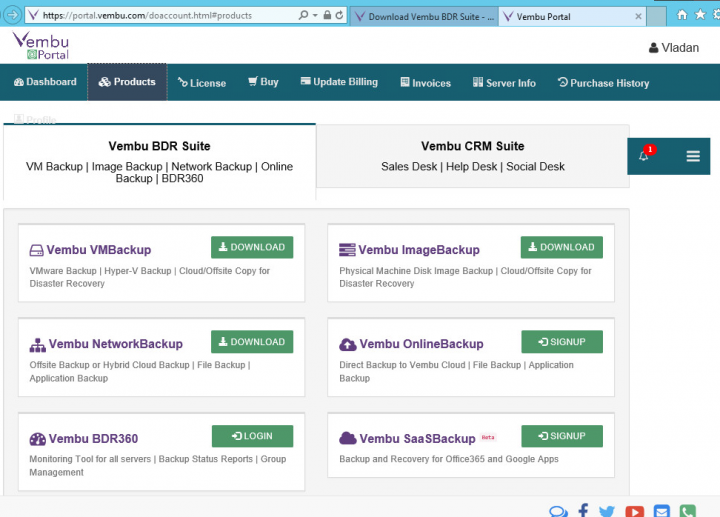 Vembu Technologies has recently released a backup and DR suite called Vembu Backup and Disaster Recovery (BDR) BDR 3.5 and this product will be the object of today’s sponsored review. The Vembu BDR Suite consists of five core products and four add-on products. Impossible to review all in a single review, but we’ll do our best. Vembu NetworkBackup – File level backup for Windows, Linux, and Mac. Can backup Microsoft Exchange Server and Mailboxes, SQL server, Sharepoint, SystemState, Active Directory & Registry Backups. Can be used also to protect client OS with Microsoft Outlook data. 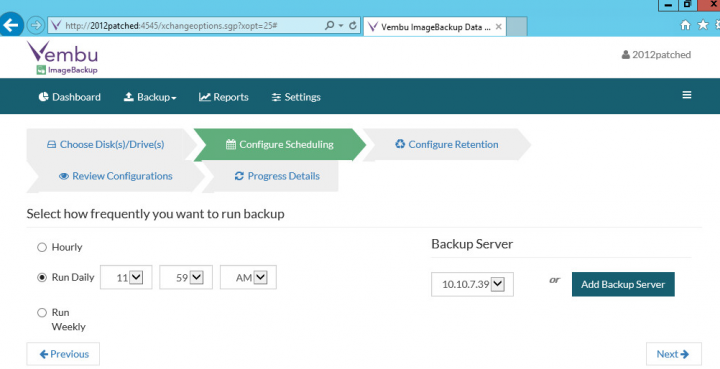 Vembu OnlineBackup – File Server Backup for Exchange, SQL, SharePoint & Outlook Backups. A multi-platform solution for Windows, Mac & Linux. Backup to Vembu Cloud. Monitoring within your Vembu portal account. For VMware vSphere, the vSphere storage API and CBT are used, where for Hyper-V, an incremental based backups are possible thanks to Vembu’s Proprietary CBT driver which tracks the changed blocks during the incremental backup. This review will try to go as deep as possible and highlight several essentials features that every administrator needs, with few interesting features that are innovative within the backup industry. like the Vembu’s file system called Vembu HIVE, which exposes every incremental backup as a virtual full backup. It means that not only that a restoration of a backup will not require a merging of all the changes to a previous full backup, but also that through Vembu Virtual Drive backup files get exposed as VHD, VHDX, VMDK-Flat and RAW image files – at the same time. Those files are created in seconds thanks to Vembu VHFS (Vembu Hive File System). Vembu BDR Suite’s Installation is very flexible and it is possible in different manners. Some admins can be working within pure VMware or pure Microsoft environment, and some of them use both. Vembu covers both environments and provides installers or preconfigured virtual appliances for both environments. It means that you can install Vembu BDR on Windows box or install it in Linux. Considering a large penetration of Windows server in the enterprises, I’ll be showing Windows Installation through this review. But Vembu product is available as a virtual appliance for both hypervisors or as an installation package for Windows or Linux physical (or virtual). Before we start the installation I’d like to touch few words about the Vembu portal. This is a view on the Online account where I’m using a trial for the tests… The portal allows you to follow the trial period, download other trial products, pay upfront for products you need/want to use or setup a monthly subscription. Within the portal, you can also see the details about your server and the Clients (VMs you’re backing up). Online Installer – you can use the web-based installer which is very small MSI package (590Kb only), and which calls the individual installers from different online depots. The individual installers for MySQL DB, for Mongo DB and also the main Vembu BDR server product. The main advantage is that the download of the starting file is small, with an inconvenience for environments that need to stay isolated from Internet traffic. But you can request Offline installer from Vembu too. Offline Installer – The second option is to get the offline installer (or Virtual appliance), which has all components for Offline installation. You can request the full installation package through Vembu sales and they’ll assist you with the installation if necessary. In this post, we’ll show the detailed installation with all the components which are part of the installation process. I picked up the online installer as I wanted to test it “as a trial” and at the very beginning, it checks for Microsoft Visual C++ redistributable, which must be present on the system. If not the system automatically downloads the component and launch the following screens showing the main components of Vembu BDR. I won’t go through every single screen, where most of them are pretty intuitive. The system fetches the individual components one after one, and every time asks you to continue with the installation. After the MySQL components install/config, you get to the MongoDB. MongoDB database needs a little attention because it asks about some additional storage (high performance) for storing the internal meta-data store. Then again, fetches the latest version (or the version tested) to execute its installation. The next step is to install the actual Vembu BDR Server. I left the default “local system account” selected and when the installation finished I re-configured the service to use the server admin account. The installation went smooth. The default storage repository and web server ports questions are invoked, as you can see on the screenshot below. Depending on your environment, you need to choose an option that fits your needs. The solution installs a web server, so as a result the web server port will be set as 6060. 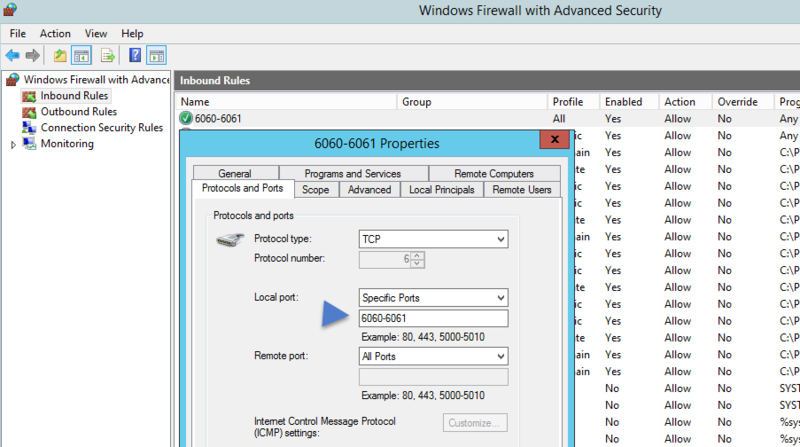 You can connect remotely to the Vembu server, but before you can do so, make sure that you create a firewall rule allowing the 6060 and 6061 TCP traffic. 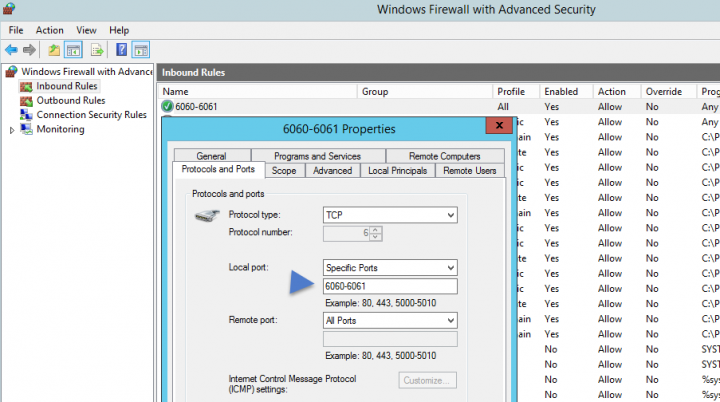 You can do that on Windows Server Box, by going to Administrative tools >Windows Firewall with Advanced Security. There you create a new rule for port range 6060-6061. Once done you can access remotely via web console…. Here is a screenshot representing a login to the admin console. Default login/password combination admin/admin can be changed after login in Menu Management > User Management > Change password icon. VMs data are encrypted and compressed on-the-fly. The backups are compressed, de-duped and encrypted at rest on storage repositories. 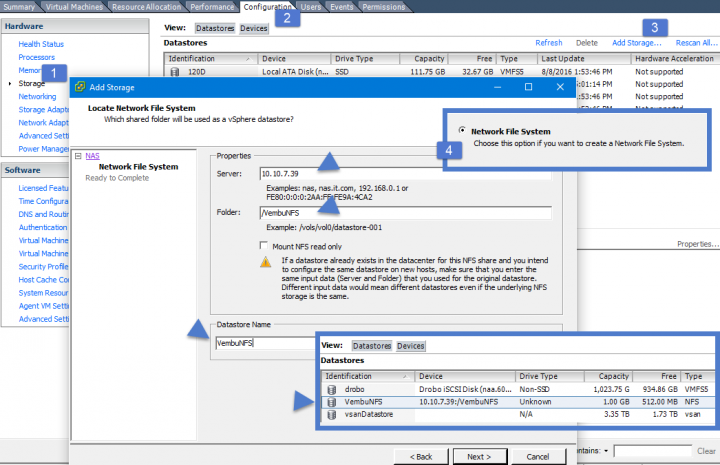 VM backup is a proxy between ESXi host and VM backup server. After adding vCenter server to the Inventory through the dashboard, we can start creating a backup job and backup some VM from our environment. We’re using vSphere 6.0 with VSAN 6.2 in our lab, but you can also add an individual ESXi host which however must have a paid VMware license. This is not a Vembu limitation, but rather VMware limitation (ESXi Free version has locked out APIs). To create a backup job for VMware vSphere, through the menu click the Backup > VMware vSphere > Click the Backup now icon. As you can see, you can manage several VMware environments in the list. You can add either another vCenter server or other individual ESXi hosts (if they are not managed via vCenter). Once you click on the backup now icon, it brings up another screen where we can choose a VM(s) we want to backup. You can select several VMs at once. 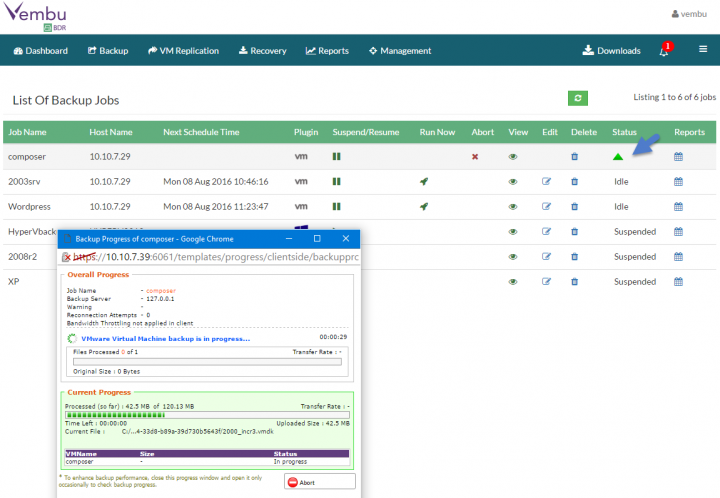 No matter if a VM is moved to another host within your vCenter, Vembu track those changes. Schedule setup – here you can select how often your VM(s) will be backed up. You can go from 15 min to 12 hours… Or, you can select the radio button “Run Daily” or “Run Weekly” and you’ll simply create a single daily (weekly) backup. Another screen invites you to select retention period, where you can keep up to 99 daily merged recovery points… Vembu does forever incremental and new incremental backups trigger the deletion of the oldest ones. Also to take into considerations a VMs which needs application aware processing. 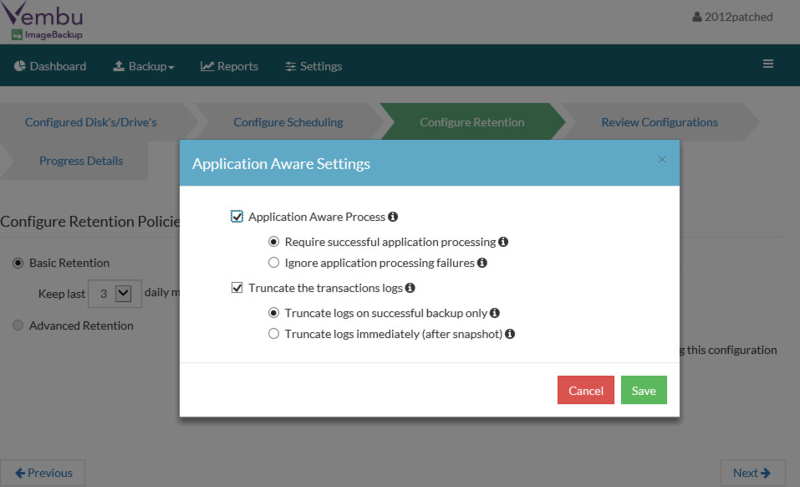 It is recommended to configure Application Servers in a separate backup job as application aware image process option can be enabled at backup job level only. On this screen you can also set Advanced Retention where when selecting GFS (Grandfather-Father-Son) retention policy. GFS retention merge incrementals on a daily, weekly and monthly basis. Daily – Daily merge will merge hourly incrementals on the third day’s first successful incremental backup. Weekly – Weekly merge will commence based on user scheduled day’s first successful incremental backup. It will merge all daily merged incrementals into a single weekly merged file. Monthly – Similar as Weekly merge, with a difference where admin need to schedule particular day in a month (let’s say second Wednesday) and the merge will get initiated at first successful incremental of the day. It merges all weekly merged files as a single monthly file. You can monitor backup progress through menu Backup > List Jobs > and then clicking the Green triangle signaling that the backup job is running right now. Option 1: Wait after business hours and initiate cold migration back to the production storage. Option 2: (you have storage vMotion license) Initiate storage vMotion. Let’s see how Vembu BDR can handle that. We will use something called Vembu Virtual Drive. It is called virtual drive since it will not occupy any disk space on the hard drive but you can access the files and folder inside the drive as usual. The files presented through the Vembu Virtual Drive are assembled from the backup chunks, instantly. It’s better to enable the NFS when setting up the environment so you’re ready to fight spyware or ransomware and not losing time just setting up the host. And then, click the mount button of particular backup to mount the backup to the Vembu virtual drive. 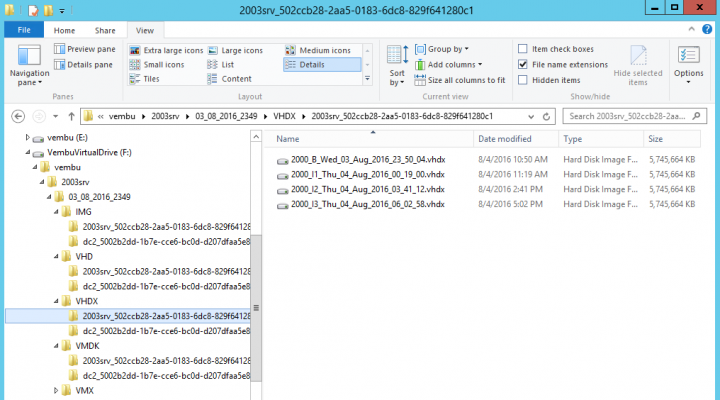 If you browse this datastore you’ll find the VMDK of your VMs laying there…. Then you would need to create a new VM > attach this VMDK to it and simply boot this VM. The feature shall be simplified in the 3.6 release scheduled for September 2016. 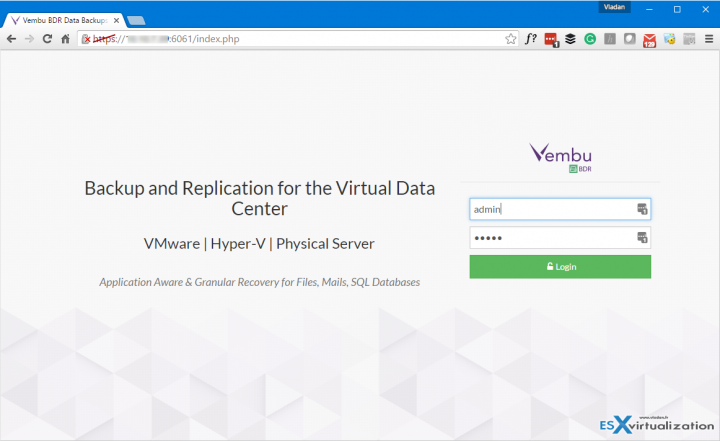 Vembu has Instant VM recovery for Hyper-V (KVM), where if you install Vembu BDR on Hyper-V Server (Physical), then you can have Instant recovery not only for Hyper-V VMs, but also for VMware VMs. How is that possible? 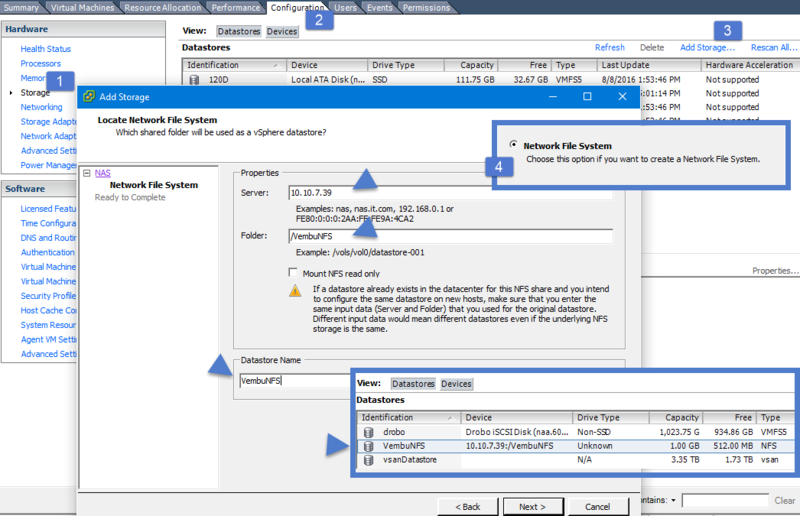 It’s because Vembu by backing up VMware VMs and automatically creates VHD and VHDX files (you can see the structure in the image above) which are, as you know, virtual disks for Hyper-V. And as those disks are on the local Vembu Virtual Drive, you can boot them directly under…. Hyper-V. The traditional restore allows you to select the restore version…. And after picking up the restore point, I’m invited to choose the restore data. My 2003 Server VM with its single VMDK disk needs to be selected. And chose the destination host/vCenter to boot the VM. Vembu HIVE is new filesystem designed by Vembu. It has built-in version control, deduplication, encryption, and in-built error correction. During the backup, the data present in the backup files or an image is separated from all the bookkeeping associated with it, like for example the metadata which is stored as objects after deduplication. Vembu Virtual Drive – reads/write using VHFS (Vembu Hive File System). The same backup can support all different hypervisor like KVM, Hyper-V, and VMWare. As a result via the Virtual drive, the same backup can be exposed as VMDK, VHD, and IMG simultaneously. 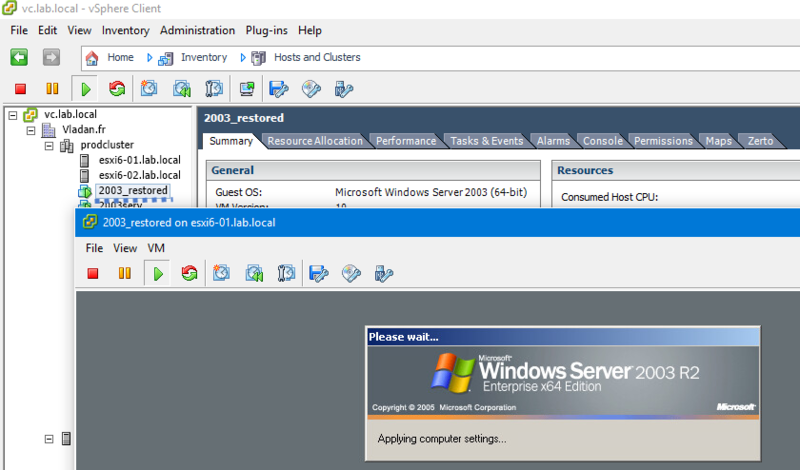 On the screenshot below you can see my 2003 Server backed up (VMware VM) and exposed as VHDX disk. Vembu has also a product for physical servers and clients. The product does one full backup and forever incremental backups then. After the first full backup done, the Vembu proprietary driver looks through the blocks and only blocks that are changed are sent to the backup destination. This allows offering as low as 15 min RPO. Image backup is free for Laptops and desktops…. Let’s see how the configuration on the client looks like. After the installation on the client, log in to the web based UI (again the login/password combination is the same as for the VembuBDR …. admin/admin), you simply point to the Vembu BDR server IP address… The client can now be configured with what to backup, with which schedule and how many backup files to keep. One more step is necessary on the client: Install Vembu Disk driver (needs to reboot the client). After the reboot, we can select the volumes to backup …. And pick a schedule that fits your needs…. Once we have done few backups of our physical host, we can have a look where those backups can be found and what other possibilities we have through the local client web interface. Note that we’re accessing the web based interface on the physical server, but we could access this host remotely as well if we would open port 4545 on the host’s firewall. 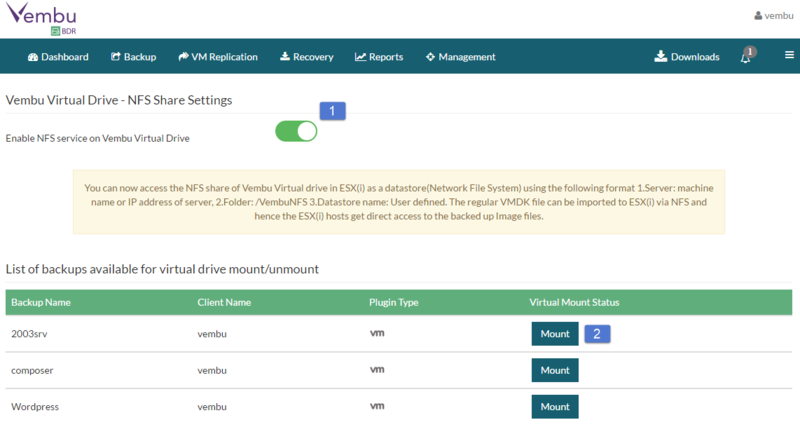 As you can see, the backups of the physical hosts are directly in the Vembu virtual drive, which is still mounted as an NFS so when we browse the datastore we can see four different backups there present as VMDK. Let’s go back to the physical server’s Vembu console. Compared to the main console, here we have a physical disk icon representing the physical host. That’s different from the VMware or Microsoft icons when we were at the main console. The list of jobs is accessible through menu Backup > List Jobs. By clicking the edit icon we can edit our schedule or if you want to run backup immediately you can simply click the rocket icon. Simple and intuitive. It is possible to change Backup schedule window in order not to run backups within working hours for example. You would want to setup this if you want to preserve your office bandwidth for production tasks and not backup tasks. If you’re backing up let’s say physical MS Exchange server, you should setup an Application-aware process which creates consistent database snapshots by quiescing the application using Microsoft VSS. We have our physical server backed up and we would like to be up and running as fast as possible as our server just died. Vembu can restore your physical system as a VM. Let’s see how it’s done. From the main console, you simply initiate a restore job. You do that by going to the Recovery menu to list the available Recovery job > then click the Restore Icon. This brings a window where we’ll choose an Instant VM recovery. Note that for this feature to work, you must have a Hyper-V role installed on the Vembu BDR server. Then on the next screen, pick the restore version > click next and select disk > and on the next screen select Hyper-V from the drop-down menu. The review screen looks like this…. 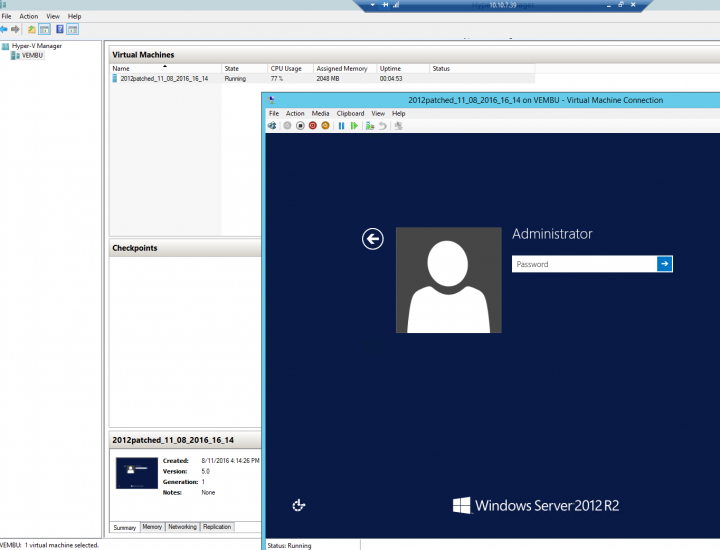 Next, when we connect remotely to our Vembu BDR server and open Hyper-V console, we can see that a new VM has been created and started. So this is how it is possible to have a DR plan for physical host(s). If you want to restore a backup of your physical server or desktop (laptop) to similar hardware you can use a free tool distributed as a boot CD, from Vembu. This boot CD allows Bare-metal recovery and can restore crashed Windows servers, desktops or laptops, back to the source hardware or a hardware with similar specifications. Worth to mention that Vembu has some free recovery tools for their backup products. One of the free tools Vembu has is Vembu universal explorer, which is a single recovery tool that allows admins to recover different Microsoft application backups like Exchange Server, SQL, SharePoint or Active directory. Instant restores emails/mailboxes/exchange stores from Microsoft Exchange. Instant restore Microsoft SQL databases and tables. Supports document level restore for Microsoft SharePoint. Supports granular recovery for Microsoft Active Directory. Vembu has certainly interesting and mature products. We can see that Vembu’s 5 backup products within their suite is something covers you with most (if not all) options to stay protected against failures, ransomware or even complete site loss. (I know, I did not write about their DR server option ….). Vembu can get you covered whether you’re very tiny business with a single server which needs to be protected, or whether you’re a big company with hundreds of machines. The Online portal where all your products, licenses, downloads, updates, support is available is well built and got me confident while testing in my lab. The product has a nice UI, which is not the fastest one, but which does the job well, without additional plugins you need to install and maintain. Vembu seems to be a nice surprise whenever you’re looking for a complete backup/DR solution with a unified UI.